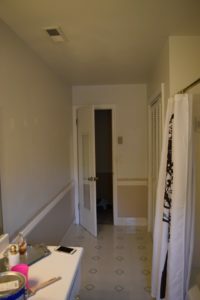 This past week I felt motivated to finally do something with one of our upstairs bathrooms. We use it for the boys and for guests and it had become a disgusting mess of junk and clutter. It was driving me crazy just to walk past it! 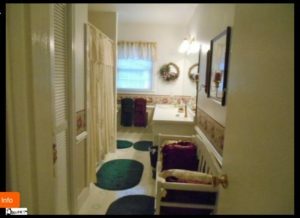 This was the bathroom when we bought the house. I had taken down the wallpaper border about a year ago, but hadn't had time or energy to paint it. TA-DA! It feel sooooo much cleaner and this re-do only cost us about $80 total, since we already had the paint leftover from our guest room. 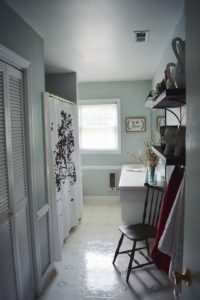 I feel like the paint color really brightened the room up and even makes the outdated linoleum more bearable! I used Olympic Misty Blue as the wall color. This wooden frame used to be a mirror, but the glass part had gotten broken in one of our many moves, so I decided to convert it to a picture frame. I just cut down that print of the boys to size and taped it in there. Oh my goodness I hate brass. This fixture was driving me crazy, so I used some Rust-Oleum high-performance enamel spray paint in Matte Black to show it some love. Side note: I don't recommend using spray paint inside...it is very messy and you will feel high (I'm not speaking from experience of course....). I love the way it turned out! It looks so much better and goes with the overall look of the room. Chris built these amazing shelves for me and I bought the brackets at Lowe's. A quick coat of stain and they were ready to go! I may or may not have made Chris hang them for me when the stain wasn't completely dry and our hands were all sticky and covered in stain. OOPS. I was just too excited to get them hung!